Fruits and vegetables add color and nutrition to your plate. According to the U.S. Dietary Guidelines, most people need 3.5 to 4.5 cups of fruits and vegetables per day. For more information. Q: Why should you wash fruits and vegetables before eating them? Washing fresh produce before eating is a healthful habit. When you properly clean fresh fruits and vegetables, you are washing away dirt, bacteria and pesticide residues. Q: What causes fruits and vegetables to become contaminated during preparation and storage? Fruits and vegetables can become contaminated by your hands or by touching contaminated surfaces, such as knives and cutting boards, during preparation or storage. Q: What is meant by cross-contamination? Cross-contamination is the spread of bacteria from one food or surface to another. To avoid cross-contamination, keep cooked or ready-to-eat foods separate from raw products while shopping, preparing and storing food items. Q: How can I prevent cross-contamination in my kitchen, especially with cutting boards? Wash cutting boards, dishes and countertops with hot, soapy water after preparing each food item and before you go on to the next item. 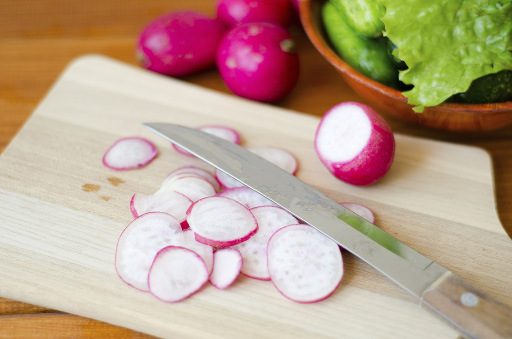 If possible, use one cutting board for fresh produce and a separate one for raw meat, poultry and seafood. When cutting boards become excessively worn or develop hard-to-clean grooves, you should replace them. Q: How do I safely prepare fresh fruits and vegetables? Wash your hands thoroughly before preparing any type of food and before eating. Use clean knives and cutting boards. When preparing fresh vegetables and fruits, cut away any damaged or bruised areas because bacteria that cause illness can thrive in those places. Bruises and mold are signs of spoilage. You can throw away the outer leaves of leafy vegetables, such as lettuce and cabbage. Wash produce under running tap water and scrub with a brush when appropriate. Do not use soap. Q: Where should you store fruits and vegetables? Store fresh-cut items, such as salad or fruit, in the refrigerator for best quality and safety. Be sure that fresh fruits and vegetables are not stored under raw meat, which could drip on them and contaminate the produce with bacteria. Whole (uncut) fruits and vegetables, such as apples and bananas, can be stored at room temperature. Q: How long can salads or cut fruits be kept at room temperature? Cut, peeled and cooked fruit and vegetables can be served safely at room temperature for two hours. Q: Can you freeze fresh fruits and vegetables for later use? Yes, you can freeze cut-up fruits and vegetables; however, vegetables should be blanched (heat-treated) before freezing. The heating process inactivates enzymes, which can cause flavor or color changes during frozen storage. Fruits usually need added ingredients (sugar, citric acid or lemon juice) to prevent browning and retain their quality.